The Wandering Fork: Indeed, the Best Pumpkin Bread Recipe! Indeed, the Best Pumpkin Bread Recipe! Okay so I think I found the best pumpkin loaf recipe which I played with a tad bit from The Streaming Gourmet blog. Wow talk about a moist cake! Somehow I just remember my loaves coming out dry in the past (maybe I overcooked them), but not this recipe. I used a bundt cake pan instead of 2 loaf pans, and it worked out great (I just left a smidgen of the batter behind so it wasn't overflowing, and baked for a couple minutes longer). I also didn't quite have enough butter, so I made up the rest with Canola oil, which could have also added to the airiness and moistness of it. I decided not to add nuts, as they're optional, but I might add chocolate chips next time! 1. Preheat oven to 350˚F and spray two medium loaf pans with nonstick cooking spray. 2. In a medium bowl, mix the flour, spices, salt, baking soda, and baking powder and set aside. 3. In the bowl of a stand mixer with the wire whisk attached, dump in the sugar. Take the butter and put it in the microwave for about 30 seconds, so that it is half melted. Dump it into the sugar. Add the eggs. Cream these three ingredients together on medium speed for about 2 minutes or until fluffy. Add the pumpkin and combine well. 4. In three batches, add the dry ingredients and mix gently until each batch is just incorporated. Scrape the sides between each batch. 5. Pour half of the batter into a one of the prepared pans. Fold the pecans into the remaining batter and then pour it into the other prepared pan. Bake side-by-side for about one hour or until an inserted knife comes out clean the top is golden. 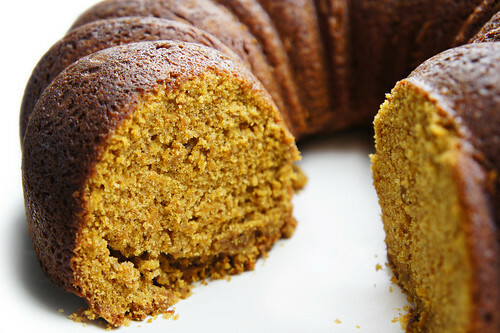 *If using a bundt pan like I did, pour evenly into the mold and spread the top with a spatula to smooth it out. It was soooo good! Ate WAY too much of it. I am crazy about pumpkin bread. The Sushi Place You've Never Heard of.